We’re celebrating Thanksgiving Day here in Canada on Monday…and while I have SO much to be thankful for, I think this particular long weekend will be more about sleeping than anything else!! Too many (very!) short nights recently have finally caught up with me; now that the initial adrenaline rush of our move has started to wear off, I’m barely able to keep my eyes open after I get home from work each evening. Never fear though, dear readers…I’m absolutely determined to once again become a fully functional blogger just as soon as possible!! And if you’ll hang in with me a wee bit longer, I promise that – before you know it! – I’ll be returning your visits and thanking you personally for all the kind messages you’ve been leaving here for me!! P.S. 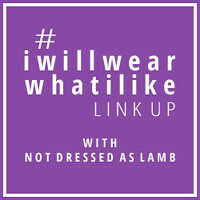 There’s another Fun Fashion Friday linkup happening at Fashion Should Be Fun; why not take a moment to see what it’s all about?! You look so great, dear Monika! Love this pencil skirt! I hope you can get some rest and get better soon. The skirt is perfect. I really want more plaid skirts but they are always so hard to find.